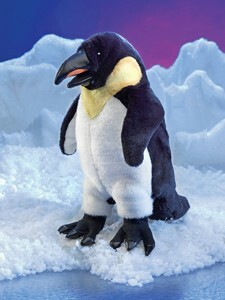 Folkmanis 2952 - Every occasion is a formal occasion for this ritzy EMPEROR PENGUIN puppet. Your hand fits inside his graceful arching neck to animate his head and beak to check for leopard seals, groom his "feathers" or nuzzle a young penguin. Measures 9” long, 8” wide, 14” tall. Hand puppet with moveable mouth and flippers.